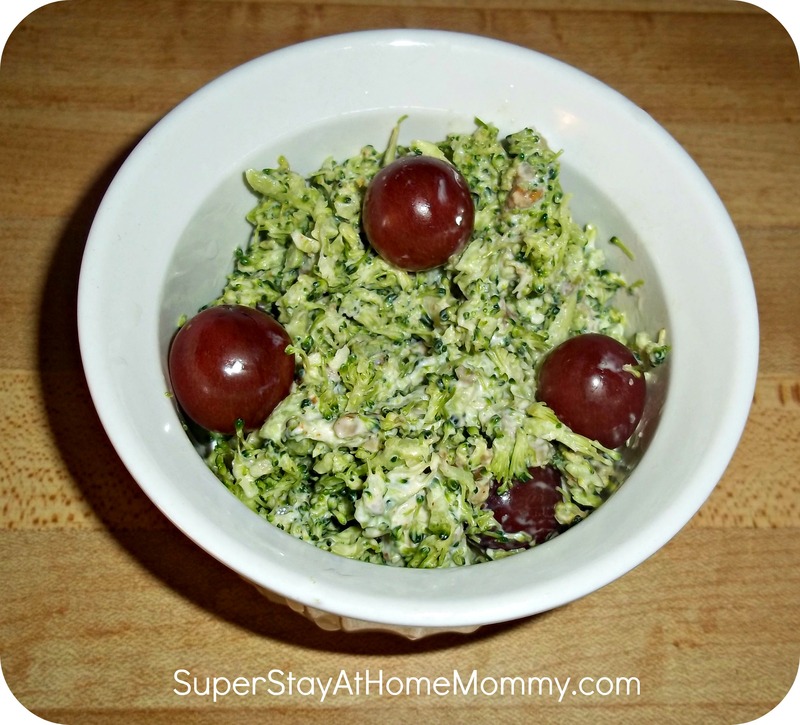 Broccoli Salad- With Walnuts and Grapes | Super Stay At Home Mommy! I’m back!! We finally got all the kinks worked out, and I’m back to blogging. I have a SUPER yummy recipe to share with you today. While we were visiting my parents in Missouri, we had this delicious broccoli salad. I have been trying to recreate something similar to it (with my own twist) since we got back home. What I ended up with isn’t exactly like what we had, but it is pretty darn yummy! Here’s what I did….. Finely chop the broccoli. I run mine through the food processor- fast and easy! Pour into bowl. Add mayo, mustard, lemon juice, and cayenne. Mix well. Add walnuts and grapes, mix again. Serve. ***Please add to, or take from, this recipe as you wish. I am not 100% positive on all the measurements I used because I sort of add things, taste, add some more, etc. I will edit the post next time I make this salad to get more accurate measurements- I was just too excited to share it with you all! Enjoy! !